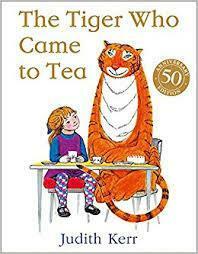 'The Tiger Who Came to Tea'. A little girl named Sophie is having tea with her mother in their kitchen. Soon they are joined for tea by a tiger who drinks all the tea, eats all the food in the house and drinks everything, even draining the water from the taps. Then he leaves. Sophie's father comes home and suggests that they all go out and have a lovely meal in a cafe. The following day Sophie and her mother go out to buy some more food, including a big tin of tiger food. But the tiger never returns. Extract - "Once there was a little girl called Sophie, and she was having tea with her mummy in the kitchen. Suddenly there was a ring at the door. Sophie's mummy said, 'I wonder who that could be?'" 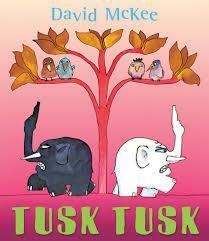 Tusk Tusk - Tusk Tusk is about black and white elephants that wage a war against one another. The peace-loving elephants disappear into the jungle and the other black and white elephants kill each other. For many years there are no elephants in the world, until the grandchildren of the peace-loving elephants emerge from the jungle. In the story, two groups of elephants - black and white - hate each other so much that they wage war against one another. The peace-loving elephants go deep into the jungle and are not seen again. In the meantime, all of the other black and white elephants kill each other. For many years there are no elephants in the world, until the grandchildren of the peace-loving elephants emerge from the jungle. These elephants are all the same color: they are grey. However, the book ends on an ironic note: "...the little ears and the big ears have been giving each other strange looks." The reader is left to predict what will happen next. Will the grey elephants uphold their grandparents' peace-loving ideals? Or will they wage war against each other as their ancestors had done over the color of their skin? These questions may be an excellent way to start a discussion of the book. A discussion beginning with questions about the nature of the "peace-loving" elephants could result in a more broad philosophical discussion on the nature of humans. If the grey elephants were peace-loving, why were they still finding fault with one another's appearance? Would you still consider the elephants to be peace-loving even though they were prejudiced towards each other? Do you think it is possible to not be prejudiced at all and to never judge someone based on a character trait? Some would argue that humans are inherently prejudiced and will never escape this cycle of discrimination. Some would argue otherwise. The black and white elephants kill each other because they do not like each other. The peace-loving elephants run away. Have you ever hurt someone because you didn’t like them? Has anyone ever hurt you because they didn’t like you? Is it good to hurt someone because you don’t like them? Is it always wrong, or do you think that it is okay to use violence to solve problems sometimes? Can you think of examples when it would be wrong? When would it be acceptable? Should the peace-loving elephants have run away, or could they have done something to help solve the elephants' problems? The elephants in the story did not like each other because they looked different from one another. Do you think the elephants’ skin color or the size of their ears means that they are bad elephants? Do you think that the way you look on the outside reflects your inner qualities (i.e. your personality)? Can you dislike someone before you even get to know them? The elephants in the story did not like each other because of the color of their skin. Would you dislike your friend if s/he had bigger or smaller ears than you? What if s/he had a different color skin than you? Do you think it is okay to judge someone because they look different than you do? Is it the same thing to not like someone because they look different than you as it is to not like someone because they were mean to you? At the end of the book the grey elephants don’t like each other because they have little and big ears. If you were to continue writing the story, what would you write? Do you think that the elephants will stay peaceful or will they wage war against each other like their grandparents did because of the color of their skin? What does it mean to be peace-loving? If the grey elephants were peace-loving, why were they still finding fault with one another’s appearance? Would you still consider the elephants to be peace-loving even though they were prejudiced towards each other? Do you think it is possible to not be prejudiced at all and to never judge someone based on a character trait? Sophie and her mummy are just sitting down for tea, when there is a knock at the door. Who could it be? What they certainly don't expect to see is a big, stripy, hungry tiger! The much-loved picture book by Judith Kerr is brought to vivid life on stage in a delightful family show packed with oodles of magic, sing-a-long songs and clumsy chaos! One of the world's most famous children's stories, The Tiger Who Came to Tea, has hit London's West End. First published in 1968, the children's classic is taking on a new life on stage at the Lyric Theatre. We caught up with the cast at the launch of the new show. Happy Birthday Becky!!!! 🎀💐🎀💐🎀❤️An ASMR type soft spoken narration of Judith Kerr's "The Tiger who came to tea," "Mog the forgetful cat" and "One night in the zoo". Please be kind 🙏🏽 If you like this video, please click 👍🏽 and subscribe to my channel.